Patients with confirmed IE to estimate mortality. Infective endocarditis (IE) has an overall 6-month mortality of approximately 25% in all-comers. Older age and history of dialysis appear to be the highest risk patient factors; IE complications also suggest a high mortality as well. Surgery is associated with a lower mortality rate but is infrequent in the high-risk cohort of patients. Mortality ranges from 10% in the lowest risk quintile to 53% in the highest-risk quintile. Surgery in this study was associated with lower mortality, but the highest risk patients were less likely to receive surgery (probably because they were high-risk surgical patients as well). This study was performed in referral centers (likely tertiary and quaternary academic centers) with experience with endocarditis and cardiac surgery. The IE Mortality Score provides an objective mortality estimate. Patients with IE may benefit from consultation with cardiothoracic surgery and infectious disease services. A simplified risk score ≥8 had sensitivity 86.7% and specificity 50.8% for predicting overall 6‐month mortality (negative predictive value of 86% and positive predictive value of 39%). The c-statistics for the derivation and validation models are 0.715 and 0.682, respectively. The derivation cohort contained 4049 patients, and the validation cohort included 1197 subjects. Park LP, Chu VH, Peterson G, Skoutelis A, Lejko-Zupa T, Bouza E, Tattevin P, Habib G, Tan R, Gonzalez J, Altclas J, Edathodu J, Fortes CQ, Siciliano RF,Pachirat O, Kanj S, Wang A; International Collaboration on Endocarditis (ICE) Investigators. Validated Risk Score for Predicting 6-Month Mortality in Infective Endocarditis. J Am Heart Assoc. 2016 Apr 18;5(4). pii: e003016. doi: 10.1161/JAHA.115.003016. Why did you develop the IE Mortality Risk Score? Was there a clinical experience that inspired you to create this tool for clinicians? We can imagine people have been wanting something like this for ages. Our previous studies in IE found a wide range of mortality rate based on clinical characteristics. Risk of mortality is largely related to host factors, IE characteristics and complications, and treatment. We sought to quantify the additive nature of these factors into a risk score that might help inform clinicians caring for patients with IE, and to promote a multidisciplinary management of this serious disease. What pearls, pitfalls and/or tips do you have for users of the score? Are there cases in which it has been applied, interpreted, or used inappropriately? This is a novel but validated risk score. It is derived from a large, multinational, prospective registry of definite IE and validated in a separate cohort. The patients had largely native valve, left-sided IE, and all patients were managed in settings with cardiac surgery available. The characteristics and complications of IE in the validation cohort were all present before surgery, if utilized, was performed, which is consistent with 'real world' clinical care. However, surgery was subject to selection bias, and was less frequently performed in the highest risk patients. Certain clinical variables (for example, diabetes mellitus) have been previously associated with higher in-hospital mortality but was not predictive of 6-month mortality in these results. It looks like the patient's own risk factors and complications make up the vast majority of the score. Is there anything that physicians can do to nudge mortality in a certain direction, once the diagnosis is made? Most of the variables predictive of 6-month mortality are not modifiable, except for the use of surgery. We have previously found that approximately 3/4 of patients with IE have a surgical indication, but only approximately 1/2 patients undergo surgery. The present study (Table 6) again shows that patients with higher risk of mortality were less frequently treated with surgery (only 25% of patients in the highest risk quintile). Surgery may have been indicated but not performed due to unfavorable patient characteristics or high operative risk. However, a multidisciplinary care approach to patients with IE, including cardiology, infectious disease and cardiac surgery physicians, may improve the appropriate use of surgery in IE. Does delay in diagnosis seem to be associated with long-term risk? Endocarditis can often be a tough diagnosis to make, especially in patients with multiple co-morbidities. There are many reasons for longer duration of symptoms before diagnosis of IE. In our study, we did evaluate duration of symptoms (greater or less than 30 days) as a variable related to 6-month mortality and the duration was not statistically significant. This may be due to the association between duration and causative micro-organism (Staph=shorter symptom duration vs. viridans Strep=longer symptom duration), which was predictive of mortality. What recommendations do you have for health care providers once they have applied the score? Are there any adjustments or updates you would make to the score given recent changes in medicine in the past few years, since the validation cohort ended in 2012? In patients who have a high predicted mortality, consultation with cardiac surgery should be requested. If such a patient is not considered to be a surgical candidate despite surgical indications, there may be modifiable operative risks that would reduce operative risk. In addition, the risk of mortality remains elevated after surgery and/or hospital discharge, and high risk patients should be monitored more closely for complications or treatable conditions. The derivation and validation model results were similar across different years (2000-2006 vs. 2008-2012). We do not have any other adjustments to the risk score at this time, but welcome additional validation in other cohorts or possible modifications. It looks like if people can survive the surgery, it reduces their risk substantially — should we be advocating more people go to surgery? It seems they're trading an immediate surgical risk for a longer-term benefit, right? Surgery was independently associated with lower 6-month mortality in both IE cohorts, and the benefit of surgery is greater in the highest risk patients. However, many of these patient may have higher operative risk due to comorbid medical conditions or IE complications. Did your group calculate an AUC statistic for your receiver operating curve? We're trying to keep track of these figures for scores so we can help our users understand some statistics better. 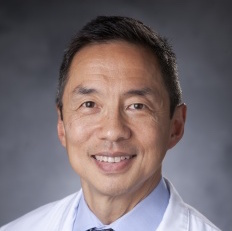 Andrew Wang, MD, is a Professor of Medicine (Cardiology) at Duke University Hospital and specializes in treating patients with heart valve disease, such as aortic or mitral valve conditions, as well as hypertrophic cardiomyopathy. His clinical research is focused on the effect of therapies on outcome for these conditions. He has led multiple research studies on the use and effect of surgery in endocarditis, which have been supported by the American Heart Association. He is dedicated to educating future cardiologists and has served as the program director for the Duke Cardiovascular Disease Fellowship since 2007, and worked on educational initiatives with the American College of Cardiology and American College of Physicians.